This 338 Win. Mag. 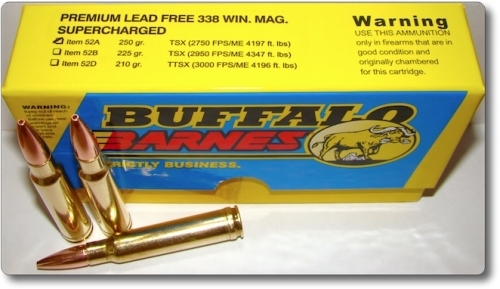 load is designed for those who want the deepest possible penetration out of an expanding bullet fired from a 338 Win. Mag. The 250gr. TSX by far out-penetrates the typical 250gr. premium type partition bullet. This 250gr. TSX load penetrates deeply enough to use on 2,000 lb buffalo, shot at bad/extreme angles. Both my 338’s have a custom 22-inch barrel as the below velocities show. For your reference, 24-inch barrels will GENERALLY give 75 fps more velocity than 22-inch barrels and 26-inch barrels will GENERALLY give 50 to 60 fps more than 24-inch barrels. Best ammo I've ever used. This last year I've taken a brown bear @15yds, black bear @210yds and a moose at @320yds. The brown bear didn't make it far the others dropped on the spot. I recovered one of the bullets from the moose and it was a perfect 4 leaf clover.